A Cup, A Mug, Or A Whole Carafe - It's Your Choice! From Lite To Bold, From Mild To Intense - What's Your Strength? How many times have you said to yourself, “I wish I could have a better coffee in my cup but without all those extra steps like manual grinding!”? The Breville BDC600XL YouBrew Drip Coffee Maker may satisfy your craving. Although it has a lot of great features there are also some drawbacks that you should be aware of. 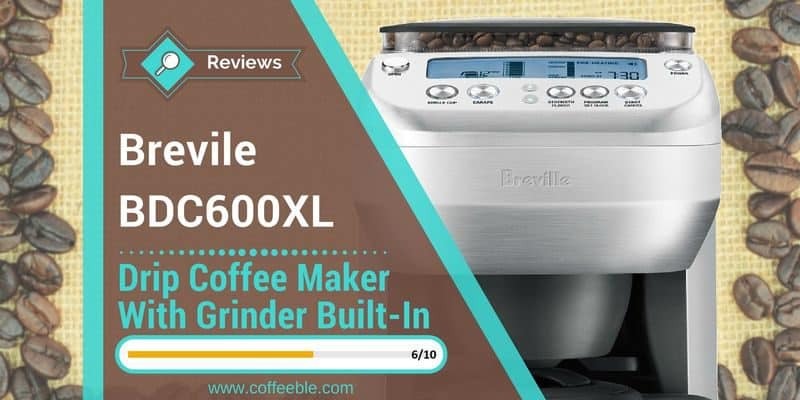 So I kindly ask you to read my whole review about the Breville BDC600XL YouBrew Drip Coffee Maker before you make a final buying decision. The Breville’s massive appearance but also the high-tech LCD display remind me of the robots in the Transformer movies. Yes, maybe I am exaggerating but with 16.2×14×9 inches it definitely belongs to the bigger drip coffee makers of its kind. And with 16 pounds of weight, you don’t have to worry a lot to accidentally push it off the table. This hulk of a coffee maker sits rock-solid on your counter. So you better choose wisely where you want to put it because it’s not that easy to carry the Breville YouBrew coffee maker around. Except the filter basket, the whole coffee maker is wrapped in a layer of brushed metal. 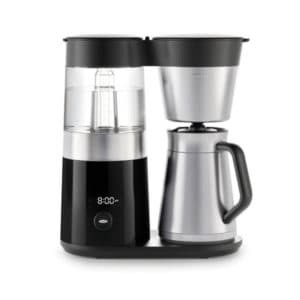 This gives the Breville BDC600XL YouBrew Drip Coffee Maker a quite modern look. After refilling the plastic hopper with up to ½ pound of coffee, you’ve got your first decision to make. How much coffee do you want to brew? A single cup, a mug, a full carafe? Or even anything in between? The Breville BDC600XL YouBrew Drip Coffee Maker gives you not less than 9 different options. I don’t even have 9 cups, let alone 9 cups in different sizes. So whether you are on the way to work or invited the whole family over for coffee and cake, you are always prepared! The stainless steel carafe can hold up to 12 cups of coffee and keeps it hot for a few hours. Although emptying the carafe seems to be cumbersome. 9 different 'single-cup' size options from 7.5oz. up to 21oz. for you to be completely flexible. Quite a few people complained about problems to empty the carafe without turning it completely upside down which results in coffee everywhere but not in the cup. The futuristic but yet user-friendly LCD-Display is the heart of the Breville BDC600XL YouBrew Drip Coffee Maker. On the backlit control panel, you are virtually the commander-in-chief! Is the coffee too strong? Let’s reduce the strength! Does the coffee in the mug taste boring? Why not increase the flavor? Not enough Java in the cup? Next time, increase the amount from 11oz to 12.5 oz. And the best: if you found your perfect coffee profile you can keep it forever. Or, until somebody else changes it after you. The machine remembers your last settings so you can enjoy your perfect adjusted cup of coffee every time. Or, until somebody else changed it. All right I am being quiet – you got it. It keeps the last used settings regardless of who has done it. Another great feature is that you don’t have to bend your neck to check how much water is left in the tank. Because there is a digital indicator in the display for the water fill level. I guess, it goes without saying that the Breville BDC600XL YouBrew Drip Coffee Maker with its ingenious display also comes with a digital clock and a timer. 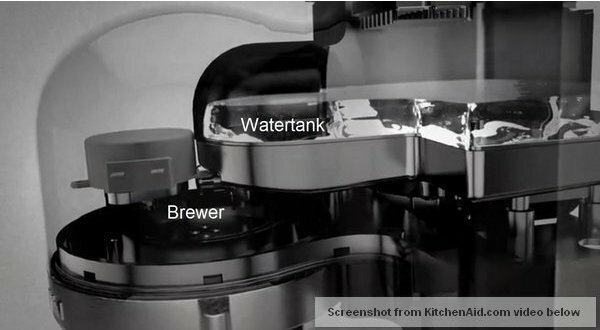 Under the hood of the Breville BDC600XL is an 1100 Watts engine to heat up the water quickly and keep it hot during the brewing process. 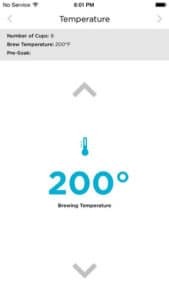 Although the heated water barely hits the 200°F it is still in the range of the recommended temperature of the SCAA, which is between 195° and 205° Fahrenheit. Hint: If you pre-warm the carafe with hot water before the brewing cycle you can increase the hours of coffee to stay hot. Of course, you should dump the water before you push the Start button. Regular cleaning is important to keep the performance at the top level and don’t clog the grinder. So taking out the filter holder, the gold tone filter basket and wiping the tunnel between the grinder and the basket should be on your to-do list after each brewing. Every other day you should also check the burrs and remove old coffee bean pieces inside the grinder. Then you should be on the safe side! With the BDC600XL, Breville has created an intelligently designed coffee maker with integrated burr grinder. But is the convenience of enjoying coffee made from freshly ground coffee beans at the push of a button enough to satisfy your craving? Are you willing to forgive this machine, when you get a good cup of Joe but grinding, for example, was not so perfect? Can you accept it, that frequent cleaning is important and should be done after each brewing cycle? If the relatively high price can’t stop you as well, I believe the Breville BDC600XL with integrated grinder is the right product for you. Related: Better Coffee with Bonavita but no grinder built-in! 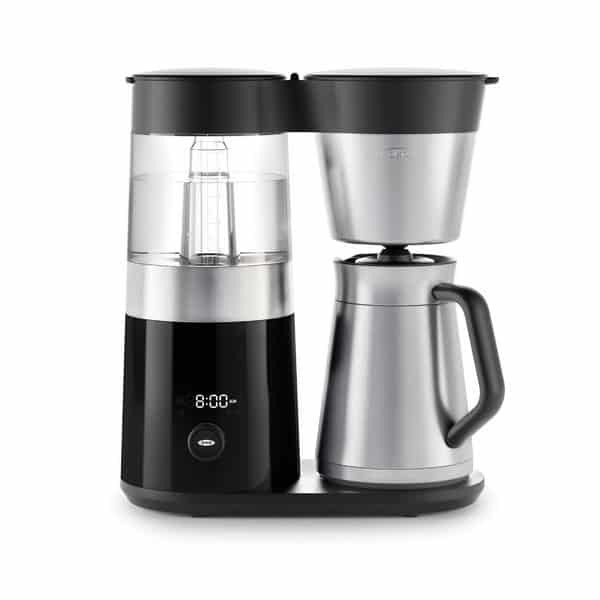 What do you think of the Breville BDC600XL YouBrew Drip Coffee Maker? Is it worth the money? Let me know in the comments below. 2 Years Warranty - No risk now, no risk later! Does it seem like no matter what kind of coffee you buy you just can’t brew a cup of coffee as good as your local barista can? Premium quality gourmet coffee is just one part of brewing the perfect cup of joe at home. There is a true science to the art of brewing! And it’s up to your coffee maker to provide the right temperature and amount of water to bring out the full potential of whatever you’re brewing. 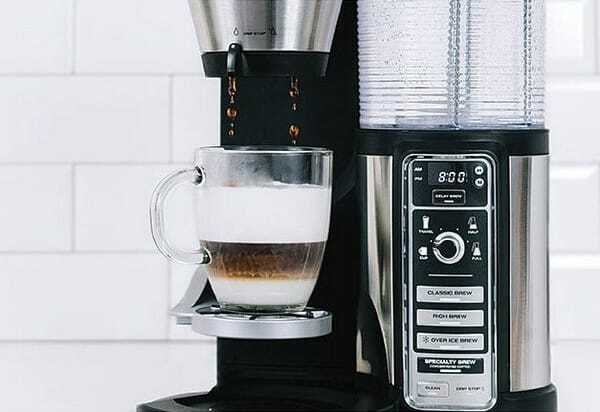 The OXO On Barista Brain 9-Cup Coffee Maker was developed with innovative technologies to create optimal conditions to maximize the aroma and flavors of the best gourmet coffees. 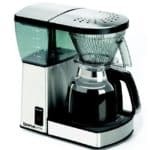 As you’ll see from this OXO Barista Brain Drip ﻿﻿Coffee Maker review, the model boasts many impressive features that you just won’t find in other coffee makers. Even those that are in the same price range. Many coffee aficionados swear by the pour-over brewing method. The slow and steady exposure to the heated water can bring out the full aroma and flavor profiles of coffees. If you’ve ever tried pour-over brewing, though, you know that it’s time-consuming. So it’s just not a practical option for someone who wants to brew up a quick pot of coffee. It should be easy, especially in the morning before work or after dinner with dessert. The OXO On 9-Cup Coffee Maker is all that combined in one machine! 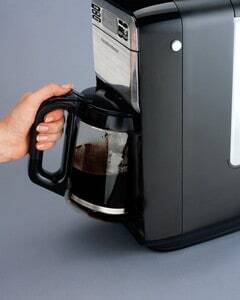 An automatic drip coffee maker with a simulated manual pour-over brewing method. OXO On Barista Brain - a combination of manual pour-over and automatic drip. A microprocessor called the Barista’s Brain (by OXO) controls the brew cycle and mimics this pour-over brewing method. At the same time, the ‘Brain’ continuously checks the temperature of the water. If necessary, it makes minor adjustments throughout brewing to keep heat levels at optimal levels. A wide rainmaker showerhead is designed to saturate all coffee grounds for a perfect flavor extraction. Another reason why your coffee tastes so damn good with the OXO coffee maker. 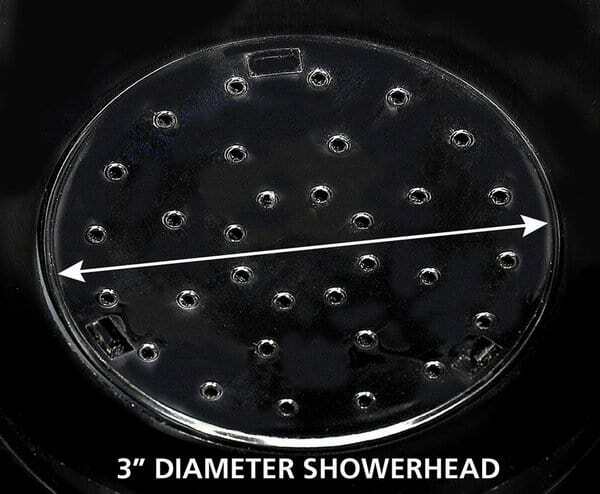 The showerhead also dispenses the water into the brew basket in timed cycles. At the start of the brew cycle, the model initiates a pre-infusion cycle or also called bloom. This short cycle triggers the release of CO² in fresh coffee beans. It also supports flavor extraction and thus, activates the unique blend of notes present in the beans. The microprocessor monitors the length of the brew cycle. This guarantees a perfect timing for the coffee grounds to be exposed to the hot water. 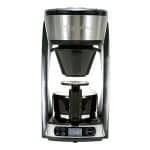 The brew cycle of this coffee maker does allow it to brew a cup of coffee that can rival that of what you can enjoy with a handcrafted pour-over cup of coffee. It’s important to note that it does take this coffee maker a little longer to brew compared to other models. This is because the cycle starts and stops several times to maintain ideal water volume inside of the brew basket. 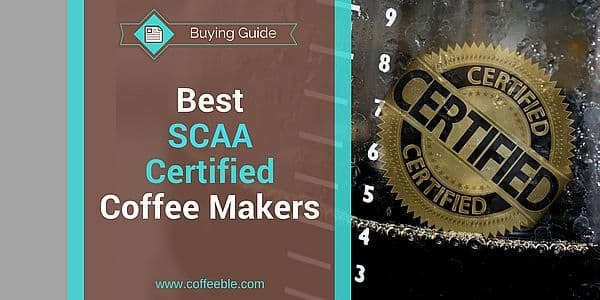 Another unique feature of the OXO coffee maker is that it is SCAA certified. The SCAA or Specialty Coffee Association of America is a nonprofit group that develops standards for coffee makers. It provides certifications only to models that meet their requirements. Because the OXO 9-cup Coffee Maker is SCAA approved, you can be confident that it provides you with a great cup of coffee. Precise water temperature control over the brewing cycle is mandatory to reach this good tasting coffee. 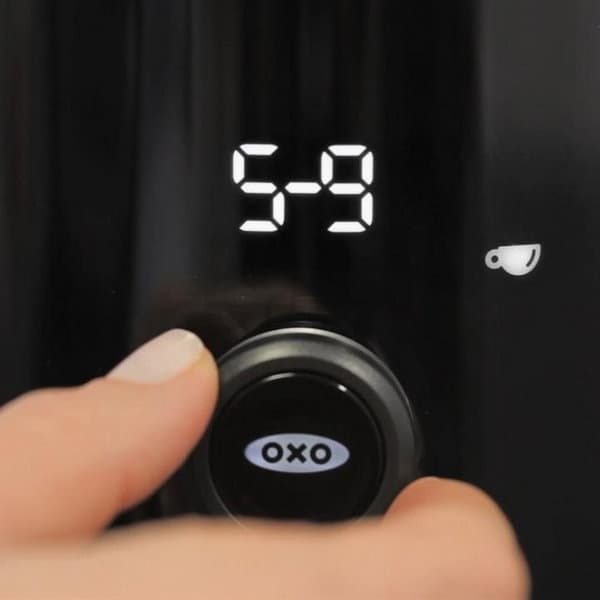 The OXO Coffee Maker is designed to brew coffee at temperatures between 197.6 and 204.8 degrees Fahrenheit. The finished brew drips into an insulated stainless steel carafe that is designed to hold coffee at the right temperature until you’re ready to enjoy it. According to reports, the thermal carafe will keep the brewed coffee hot. But it does not keep it at an optimal temperature for as long as some competitors like the Brazen Plus by Behmor. Every sip of coffee tastes the same thanks to the internal mixing tube inside the carafe. It blends the coffee while it's brewing. 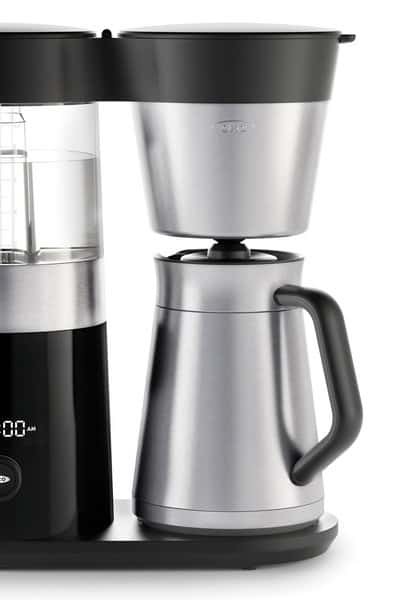 If you typically finish a pot of coffee within 2 hours of brewing, the thermal carafe of the OXO On Barista Brain 9-Cup Coffee Maker will likely meet your needs. Yet, if you tend to come back to the pot over the course of many hours, you may need to reheat your coffee in the microwave. The OXO Barista Brain is designed to make home brewing as easy as possible. The model features an LED interface that is easy to read and has intuitive controls. With a simple twist of a knob, you switch the brew amount from 2 to 4 cups or 5 to 9 cups at a time. With a push of the button, you confirm your selection. 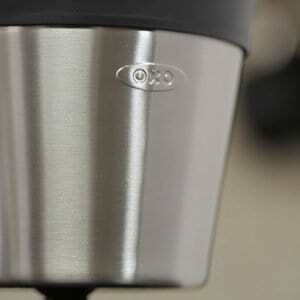 Once you have set the desired number of cups, the Oxo On 9-Cup Coffee Maker does the rest. 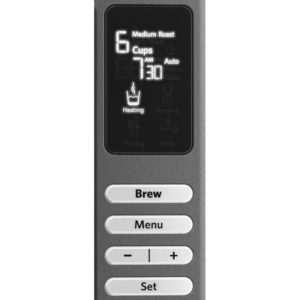 Brew time and temperature are set automatically and give you the best results. 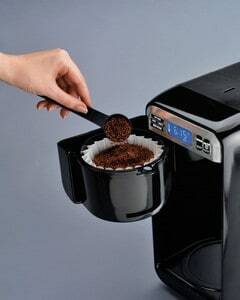 This takes the guesswork out of brewing, so you end up with a superb cup of coffee. 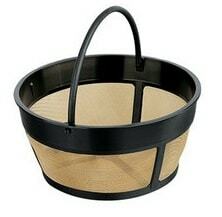 The cone-shaped brew basket also ensures that all the flavor compounds from your ground coffee beans are extracted. As a result, your coffee is equally robust whether you brew two cups or nine cups at a time. Oh, by the way, OXO has included a 1 cup coffee scoop and 10 standard #4 filters so you can start your first brew instantly. Imagine this tragedy: you just got your new coffee machine delivered but forgot to buy coffee filters. Fortunately, it cannot happen with the OXO coffee maker. If you prefer a permanent gold filter instead, no problem! It will also fit, although it’s not included. There is also an internal mixing tube in the thermal carafe that blends the coffee as it drips. So you don’t end up with the first brewed drops all on the bottom. All these features come together to give you the most delicious experience with every sip. Unfortunately, the 9-Cup version of the OXO coffee maker does not have a removable kettle. The kettle in the 12-Cup version heats water and can be removed for a cup of tea or cocoa. If this feature is important, you should have a look at the OXO On 12-Cup Coffee Maker now at Amazon. 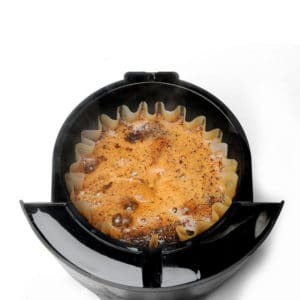 The OXO On 9-Cup Coffee Maker is highly functional, but it’s also attractively designed. 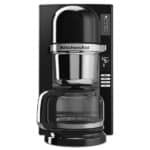 The sleek stainless steel and black-finished plastic give the drip coffee maker a distinctive modern look. This isn’t a coffee maker that you have to put away between uses to keep the kitchen counter top area stylish. The contemporary design will blend in with your decor perfectly. And you don’t have to worry about cleaning at all. Most parts, like the rainmaker showerhead or the mixing tube, are removable and top-rack dishwasher safe. Although it’s a 9-Cup coffee maker, the carafe itself holds about 48 oz. of coffee. If you serve coffee in larger mugs, you may only be able to get 4-5 large cups out of the carafe. Another important thing to note is that all the materials featured in the OXO 9-cup Coffee Maker are BPA free. This ensures that your coffee doesn’t end up contaminated with the potentially toxic compounds found in some plastics. 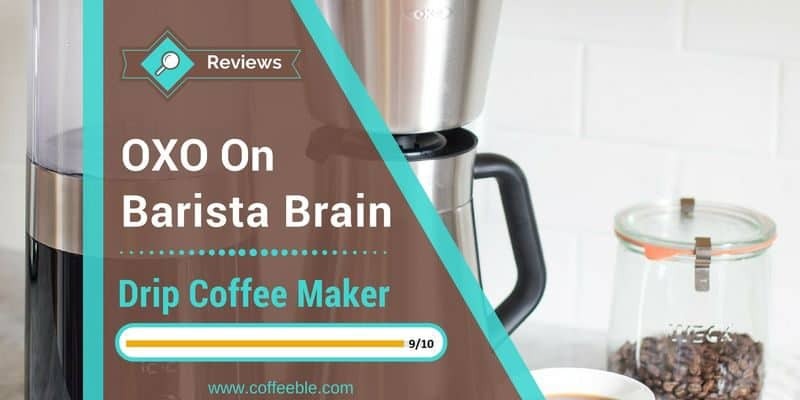 While the plastic components in the OXO On Barista Brain 9-Cup Coffee Maker are durably crafted and nontoxic, some people do feel that plastic can alter the taste of coffee. Any effects on the flavor of your brewed coffee should be minimal, though! And you may not even notice a difference in taste at all, as not everyone has this perception with plastic parts. Who does not want a coffee maker with a brain, that does all the thinking for you! The only thing it can’t do is to order more coffee beans and refill the water! That’s still your job! Other than that, the OXO On Barista Brain Coffee Maker has all it takes to promise you an incredible tasting cup of coffee – every time! It is indeed an expensive coffee maker, but so is Rolls Royce. And OXO is so convinced of the quality of their product, that they offer you 2 years of warranty instead of one! So if you are thinking, “Maybe I should” please do! You simply can’t lose! Although there are many different types of coffee makers available nowadays, a lot of baristas still prefer the traditional pour over method to brew exceptional coffee. To do it yourself at home you really don’t need expensive tools. A coffee dripper and preferably a gooseneck kettle is all that is required for you to get started! But if you are not careful and monitor the key factors like pre-infusion time (the bloom), correct temperature, or the size of the grind, you can easily ruin your expensive speciality beans, that you have just purchased from the premium roaster in your city. As you can see, the manual pour over method requires time and practice until you can expect to reach a consistent but great cup of Joe. Drip coffee makers, on the contrary, are convenient (you set it and forget it) and typically brew the same quality of coffee with every brew! However, the average drip coffee machine often does not meet the standards that are required to brew exceptional coffee. Specifically brew temperature, pre-wetting (the bloom) or pulse brewing are often neglected and result in just an average cup of coffee. The KitchenAid pour over coffee brewer claims to combine the convenience and consistency of drip coffee makers with the excellent result of manual pour over brewed coffee. 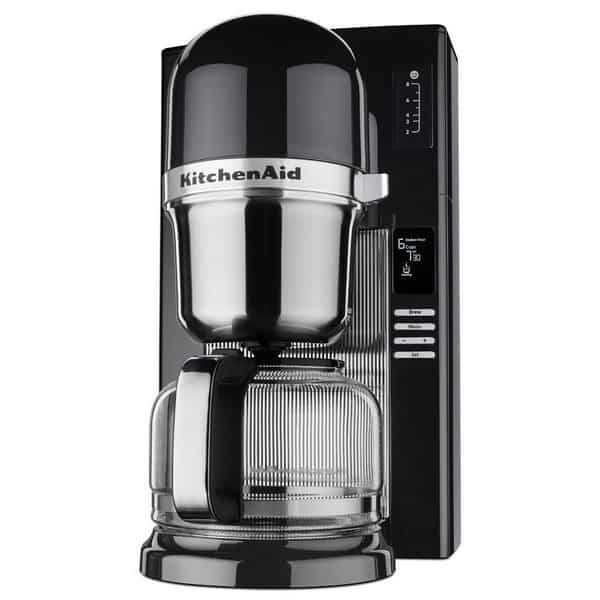 After you have read my KitchenAid Automatic Pour Over Coffee Maker review, you will understand its features, how to operate it and, most importantly, whether this is the best drip coffee maker for you or not! Imagine you walk into a store and see the KitchenAid Pour Over Coffee Brewer the first time. You are not sure exactly why you are hesitating, but somehow you feel attracted to it. Maybe the classically elegant lines that merge visually with the smartly designed program bar makes this coffee brewer a head-turner. Granted, the housing is made of plastic but at least you can choose between three different colors: empire red, contour silver, and onyx black (click image to enlarge). The automated pour over technology seems to require a lot of space because this coffee maker is really tall. From bottom to top it measures a whopping 15 inches! Assuming your kitchen cabinets are mounted at a common height of about 18 inches above the countertop, there is not much space left. And since you need to refill the water reservoir from the top, you may run into problems. Sliding the coffee maker out might not be that easy because there are black rubber pads at the bottom. In case you still plan to place it under the cabinets, please check my Coffeeble-Insider-Tip below how to easily solve this problem. You can definitely count on the KitchenAid KCM0802 coffee brewer when it comes to performance! Maintaining a temperature between 195° F and 205° F is only one of many requirements to make it on the list of SCAA certified home brewers. And yes, the KitchenAid Pour Over coffee maker has passed this and all the other tests and is therefore a certified SCAA coffee maker. It is located partially above the brew basket. That’s very smart, because even I, who barely got a C in Physics in school, know that heat rises up. As a result, the water in the reservoir stays warm and less energy is needed to reheat. I read a lot, that this coffee maker is slow and you know what: it’s true. It takes about 10 minutes for 8 cups of coffee. But to be brutally honest, that’s the price you pay for the simulated pour over method. A drip coffee maker just flushes the coffee basket as if the world ends tomorrow. But don’t get me wrong! I like drip coffee makers. There are some out there that really brew awesome coffee! 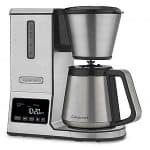 However, this Kitchenaid coffee brewer uses a pulse function throughout the brewing process which simulates the manual pour over process. Pour some water, wait until completely soaked in, pour more water, wait, and so on. This intermitted process ensures the coffee grounds to be fully saturated with water. As a result, you get full-bodied coffee rich in flavor because of the best extraction possible. KitchenAid made sure the operation is easy right from the start. All settings can be changed from the control panel with the Menu button and/or the + or – toggle bar (click image to enlarge). What I also like is the simple interface, which always keeps you updated about the current brewing process. You know when it is heating, steeping, pouring and even tells you when it’s time to sit down and enjoy your coffee! 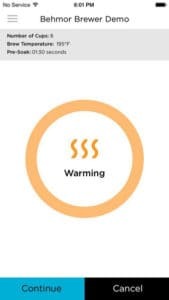 Additionally, it informs you when the warming plate is activated or a cleaning cycle is necessary. Unfortunately, the KitchenAid Pour Over Coffee Maker comes only with a glass carafe. There is no option – yet – to choose a thermal carafe version. Most coffee makers with glass carafe have a heating plate that keeps the coffee hot for a couple hours before it automatically shuts off. I’m honestly not really a friend of this so for me it’s not a big deal that the warmer of this coffee brewer shuts off after an hour. In case, you want to spread your coffee over the whole day I would definitely recommend you to invest in a thermal carafe. Please avoid turning it back on again and again. Your coffee will burn and taste awful! 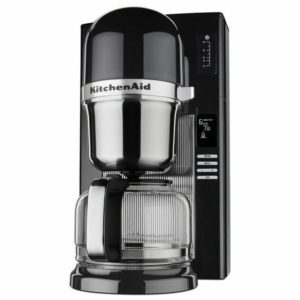 As I mentioned earlier, this KitchenAid coffee maker is quite tall – too tall for most kitchens to fit neatly under cabinets and at the same time leave enough space to refill the water tank. You can pull it out every time you need more water, but with almost 8 pounds, it’s not a very lightweight coffee brewer. And even worse, the rubber pads, that prevent the coffee maker from sliding, may leave some black lines, especially on light-colored countertops. But I found the perfect solution for you. Click the link below so you can see it yourself! Discover how easy it is to access your coffee maker's water tank! 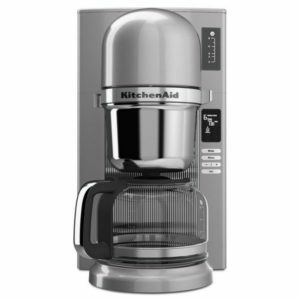 The KitchenAid KCM0802 coffee brewer may cost more, but it’s worth more! My only question to you is: do you think you can taste the difference? Are you confident that the quality of the coffee justifies the high price of this pour over coffee maker? Convinced? Well, this is your moment! Check the discounted price and get your KitchenAid Pour Over Coffee Maker now! You’ll be glad you did, believe me! 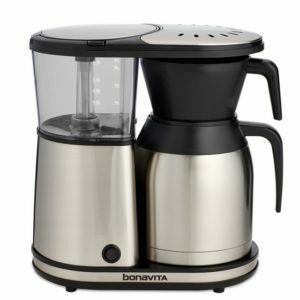 And in case the price is a little too steep for you, please check my Bonavita BV1800 drip coffee maker review which could save you some money. 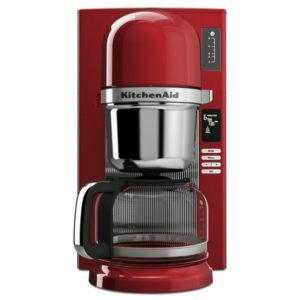 Please share your comments with me, if my Kitchenaid Automatic Pour Over Coffee Maker review could help you with your buying decision! Ninja’s in-home coffee bar is a brand new classification of brewers that features the ability to prepare many types of freshly brewed beverages. The design mimics what you would find behind the counter in today’s fancy coffee houses like Starbucks. The Ninja CF080Z Coffee Bar brewer is one example of these coffee bar machines. It is capable of creating your favorite hot and cold brewed drinks. Whether you want a thirst quenching glass of iced coffee in the summer heat or a relaxing cup of freshly brewed cappuccino, the Ninja coffee maker can handle it. Release that inner barista inside you in your own kitchen and make your family’s favorite brewed beverage. No more having to jump in the car and drive to one of the many local coffee houses to get a great tasting cup of coffee. 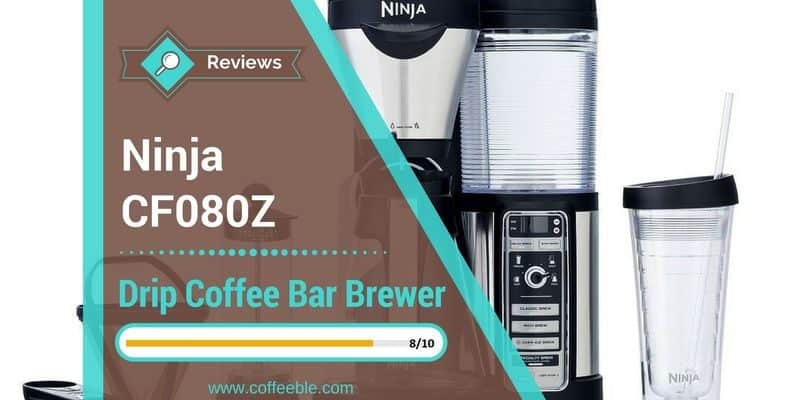 The Ninja CF080Z coffee machine makes a great cup of coffee and what’s the secret behind it, you will find out through my Ninja Coffee Bar review. The Ninja CF080Z Multi-Serve Coffee Bar is a complete coffee brewing system that delivers a great tasting cup of coffee, both hot and cold. It features a unique brewing process that varies the strength of the coffee according to your preset preferences. With a simple touch of a button, you can select how strong of a cup of coffee you would like as well as how much coffee you want to brew. Select a single mug, travel mug, half and full carafe, each one will be perfectly brewed every time. You can also set a timer to brew your favorite coffee so that it is ready for you when you need a cup the most. Another unique aspect of the Ninja Coffee Bar is that you can create a wide range of coffee-based drinks that include either hot or cold liquids. The Ninja CF080Z gives you a combination of a single serve coffee maker, drip coffee maker, cappuccino machine and iced coffee maker all in one machine. Whether you are wanting a single cup on the run before work or making a full pot, you can select how much coffee you want with a simple turn of a knob. 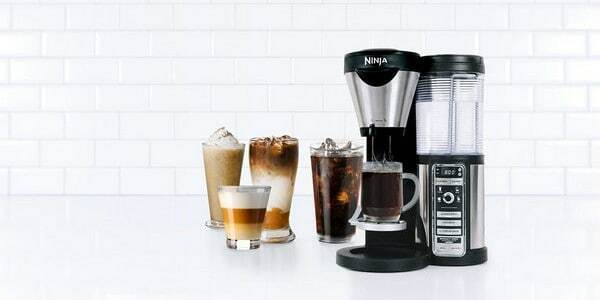 The Ninja Multi-Serve Coffee Bar is a full function beverage machine in that it’s capable of making a wide range of your favorite hot and cold drinks. This includes freshly brewed coffee, tasty iced coffee and even a fancy cup of espresso-like coffee that is authentic enough for a delicious cappuccino. 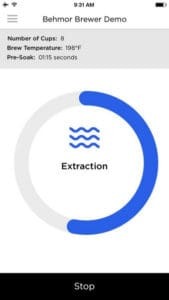 Using a unique Auto-iQ One Touch Intelligence brewing process the Ninja coffee maker will bring out the best flavor out of the coffee grounds. And it doesn’t matter how much you brew – Auto-iQ always uses the right amount of water. If you have read some of my other posts, you know that I always recommend grinding your coffee beans right before the brewing process. But Ninja promises that even if you normally use lower quality, store brand coffee grounds you will get a much better cup of coffee every time, without having to leave your house. Classic Brewed Coffee – not too strong and not too weak. Making fresh brewed iced coffee presents a unique situation in that pouring a hot liquid over ice cubes has a tendency to water down almost all drinks. This is where the Ninja CF080Z Coffee Bar’s exclusive Auto iQ feature comes in again. 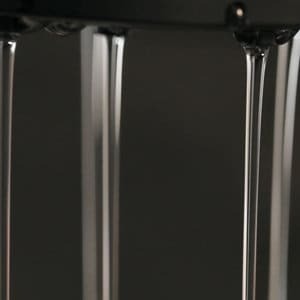 It will automatically adjust the level of coffee concentration as the liquid is poured over the ice. This will help compensate for the amount of water that will mix with the coffee as the ice cubes begin to melt. As a result, every cup of iced coffee tastes as delicious as it would if it was poured hot. If your favorite brewed beverage is a bit more on the creative side and you like a good cup of unique layered beverages, the Ninja CF080Z can dial up the concentration level and deliver a strong cup of coffee, almost espresso-like. Using the special milk frother that comes inside the package you will be able to create each of the extra layers for specialized coffee drinks. With most coffee makers you only receive a manual next to the coffee maker itself but no extras. Ninja, though, offers a variety of packages which could be a little confusing in the first place. So make sure to carefully select the model of your choice. The CF080Z Multi-Serve Coffee Bar is a feature packed machine that makes a classy cup of coffee that would rival even the best coffeehouse. It comes with absolutely everything you would need (well, except the coffee grounds) to get started. Worth mentioning is that the CF080Z model is completely BPA-free, according to Ninja. The Ninja exclusive Auto-iQ technology delivers the precise amount of water and the prescribed temperature to create the best tasting cup every time. The package also includes a book with 40 coffee drink recipes to get you started with your new coffee bar. While for the most part the Ninja Multi-Serve Coffee Bar is a pretty good machine, the glass carafe is a bit small and don’t think that 43oz. of coffee is enough for a whole family of coffee drinkers. The other thing is that at about $170, it is a bit on the expensive side. 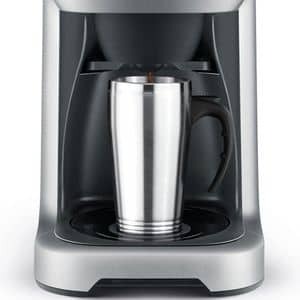 As someone who enjoys a really good cup of coffee, I can tell you the idea of being able to brew my own cup, a full carafe, iced coffee, or even cappuccino with only one machine really appeals to me. With the Ninja CF080Z coffee maker, you can also save some money since you don’t need to visit any coffee shop anymore. 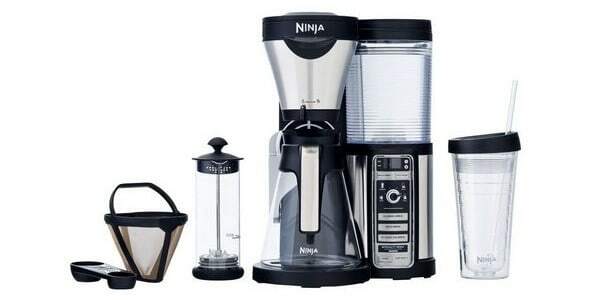 I would highly recommend the Ninja Coffee Bar to everyone who is in the market for a top rated drip coffee brewer who wants more than just a traditional drip or 1 cup coffee maker. Now it’s time for you to get creative and buy your Ninja Coffee Bar with glass carafe now! Make delicious Cappuccinos at home AND save money! 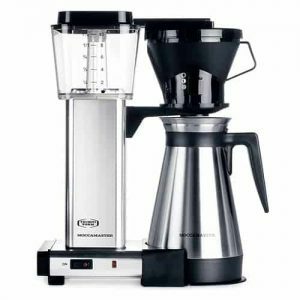 You are here because you are in search of a drip coffee maker that can work like a pro and give you the ideal cup of coffee. Am I right? Then you need to get your hands on the Brazen Plus Coffee Brew System. Nobody should face Mondays without a hot cup of coffee brewed to perfection! Because coffee is what makes you start off your day with an energy boost! The demand of this hot beverage has increased all over the world as it is the first thing people sip before leaving for work or morning chores. The Brazen Plus by Behmor is a powerful machine that offers you full command over the coffee brewing controls. You can brew your coffee beans according to your unique coffee preferences, the way you want. Your brewing process determines the quality and flavor of your coffee. This is why you need the Brazen Plus Coffee Brew System which will give you outstanding results. It is a versatile, feature-rich drip coffee maker for your home. In my Brazen Plus Drip Coffee Maker Review, I will show you why this coffee maker may be the perfect choice for your next cup of Java. The Brazen Plus Coffee Maker has an effective temperature control brew system that is fast and accurate. You have complete control over the temperature of your water source. 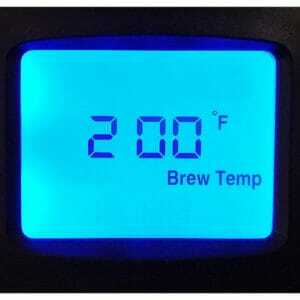 Use the easy-to-read digital screen to select the brewing temperature for your coffee beans. The Brazen Plus allows you to set the temperature from 190-210 °F. According to the Specialty Coffee Association of America (SCAA), the recommended temperature for brewing coffee is between 195-205 °F. The brewing process itself will take about 5 minutes. The actual brew time recommended by the SCAA is 4-8 minutes. Add another 5 minutes for heating water plus pre-soak (or pre-infusion) time and you know how long it roughly takes to brew a full carafe. The pre-infusion function in the Brazen Coffee Maker allows you to fine tune the extent of time the grounds can bloom. Not many drip coffee makers let you set the brew temperature like the Brazen Plus does! The benefit this brewer offers is that you can adjust how long the coffee can bloom. You can set the pre-infusion time from 15 sec. – 4 minutes. Letting your coffee bloom releases all the carbon dioxide in the grounds. This will have a major effect on how your coffee tastes. The Behmor Brazen Plus saves all your directed settings in its permanent memory. These calibrations remain saved until you decide to change a parameter. At last, I want to add that you can save some time by turning off the pre-infusion setting when using ground coffee from the store. Only coffee beans roasted within the last couple weeks are still releasing CO2. And being roasted within a few weeks does usually not happen with store brand coffee. The Brazen Coffee maker incorporates an over-sized shower head that is of 3’’ in diameter. Accompanied with pulsed water flow, it allows better grounds saturation and extraction. The over-sized shower head and pulsed water flow create turbulence in the coffee grounds bed to fully saturate them. It ensures complete coffee bed saturation for a splendid coffee extraction. The Brazen Plus is one of the few coffee machines certified by the Specialty Coffee Association of America (SCAA). This coffee brewing system meets their standards based on many requirements like water brewing temperature or perfect brew time. Brazen Plus by Behmor was the first certified coffee maker under the SCAA’s standards and newest testing procedures. When this is no reason to invest in on of the best coffee maker, then what? Yes, I said invest. 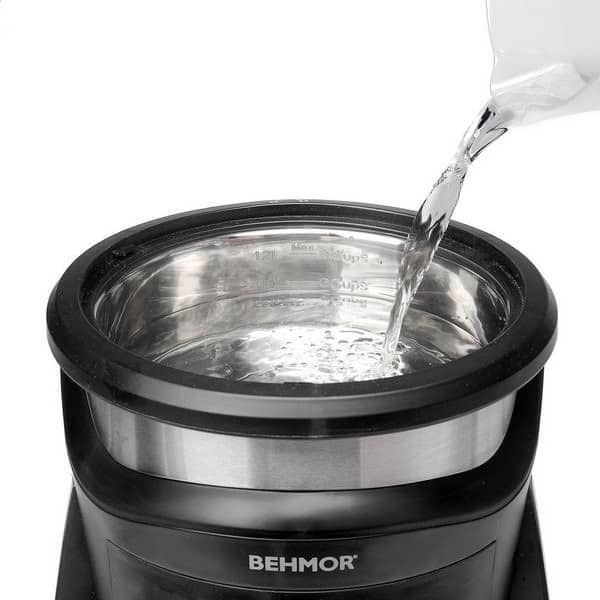 Because the Behmor Brazen Plus Coffee Maker is not cheap. And for this price tag, I would expect to see less plastic and more high-quality materials. Yet, the features of the Brazen Plus Coffee Brew System are exceptional compared to what other coffee makers offer. And by the way, all plastic in the Behmor Brazen is BPA free. The Behmor Brazen Plus is no ordinary-looking coffee maker. Its design consists of a cylindrical top, circular stainless-steel base, and three-legged body. It kinda reminds me of a rocket ship that is about to going to outer space any minute. 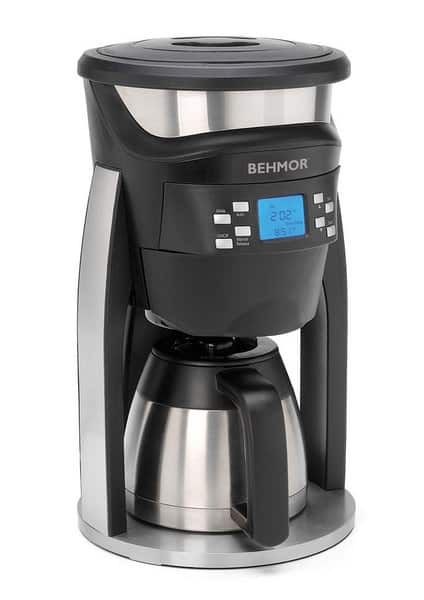 Thanks to the insulated stainless steel thermal carafe inside the Behmor Brazen Plus, your coffee stays hot for a couple hours – even longer when you preheat the carafe with hot water. You won’t need a hot plate burner to do this job. But the weak point of the thermal coffee pot is its size. A family of four can enjoy about one and a half cup each before the carafe is empty. Except you consider a cup to be 5 ounces then the Brazen Plus indeed makes 8 cups as described at Amazon.com. My typical cup, by the way, is usually 8 ounces so I would get 5 cups out of it. Another great feature is the stainless steel water reservoir, which should leave no plastic taste in your coffee. Let’s face it, maybe 98% of drip coffee makers have a water tank made of plastic. Not the Brazen Plus! Even better, the stainless steel water tank is at the same time a heater. The heater is not hidden inside the housing of the coffee maker. So you can identify if you need to descale the Brazen Plus when you detect mineral deposits. Inside the water reservoir, you’ll notice water level lines to show the capacity it can hold. You can fill it up to 40 ounces of water or 8 cups. Again, the 8 cups are misleading in my opinion. Not unique, but worth mentioning is the brew timer, that the Brazen Plus offers. Who would not love to have a cup of coffee ready when you wake up in the morning? And even better, when you leave the house in a rush, the machine goes into sleep mode by itself. This saves you some money but also you don’t have to rack your brain whether you turned off your coffee maker or not. The only home drip coffee maker that I know, that has a stainless steel water reservoir (instead of plastic). Oh no, it’s not a question of either or. 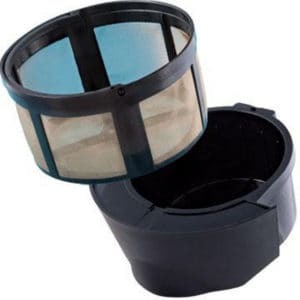 Included in the package are both the filter basket and the gold filter. Using the gold filter will let the oils in the beans pass into your cup. The result is a strong, full-bodied coffee. But some say the oils increase bad cholesterol or they just don’t like a strong flavor. If you agree, use the filter basket and a paper filter. The paper filter blocks the oils, which can lower cholesterol. At a downside, it could also reduce the intense flavor that comes from the coffee oils. 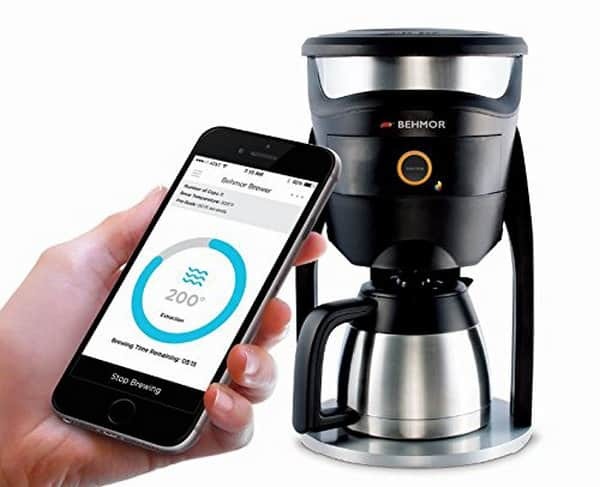 Behmor has now a coffee maker supported by a smartphone app. 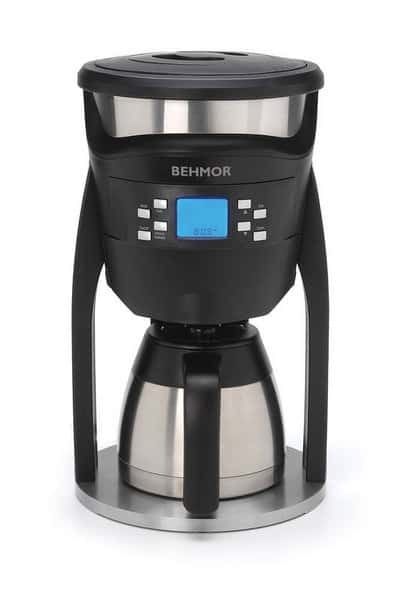 The Behmor Connected Coffee Brewer offers the same great features of the Brazen Plus. A single Start/Stop button has replaced all the buttons on the front panel. With your smartphone, you can set all the features from temperature to pre-infusion time. And best of all, you can save your preferred settings to the Start/Stop button. Track the brewing process and get notifications when your coffee is ready. There is also a Buzz feature with brewing profiles from several professional coffee roasters. If you don’t have a smartphone yet, you can still use this coffee machine. The Start/Stop button has a default setting for pre-infusion and temperature. The price tag of the Behmor Connected drip coffee maker is pretty high, considering there’s only the app, that’s different. 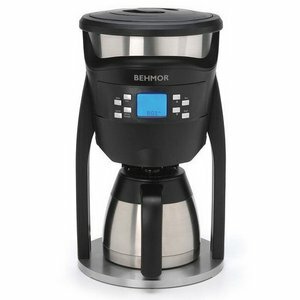 But, Behmor also offers a home coffee roaster supported by the same app. So if you are seriously interested into coffee roasting and brewing, the app supported Behmor coffee maker may be the perfect choice for you! The Brazen Plus takes your standard drip brewing to another level! All the tech options make it a modern and contemporary machine that can work in any home or office. The Brazen Plus by Behmor is user-friendly and quite easy to set-up, allthough it could take some trial and error until you found your perfect configuration. But when you did it will for sure brew a rich and flavorful cup of coffee. In short, it’s one of the best drip coffee makers for your home. The small coffee pot and the hefty price tag may act as a deterrent but you’re paying for quality. And when you got it I’m sure it’s a coffee brewing system you’ll be proud to own! 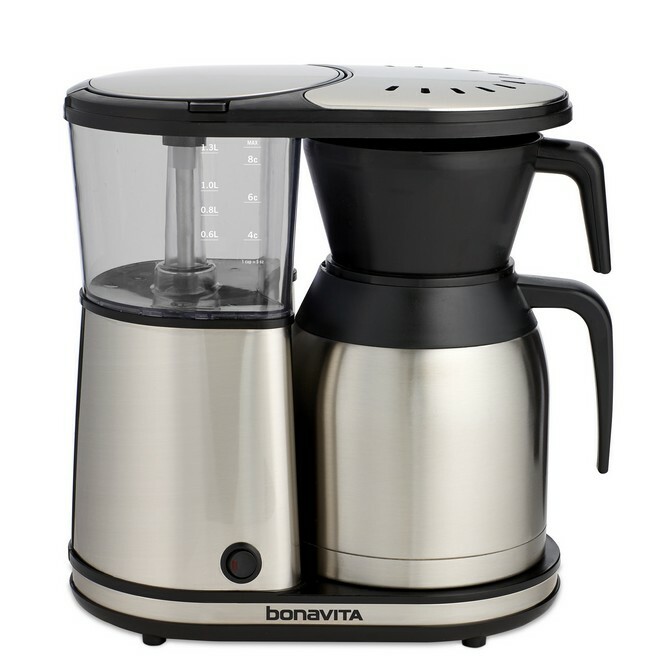 You: Wow, the Bonavita BV1800 with glass carafe is not cheap for $150. Surely it does have a display and a timer, doesn’t it? You: But it has drip stop, right? So I can get a cup before the brewing process is completely finished? You: Hmm, I also can’t find the strength regulation to brew stronger or weaker coffee. Let me interrupt here! Because I don’t think this will convince you to actually buy this coffee maker, right? Why does this Bonavita BV1800 8 Cup Coffee Maker has over 1500 5-star ratings at Amazon? 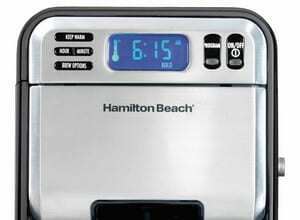 Why should you buy a 150 bucks drip coffee maker when you can buy a $50 Hamilton Beach coff﻿﻿﻿﻿ee maker with way more features? What is so great about this coffee maker when even professional Barista’s recommend it? As a smart coffee lover, you may already know the answers. Imagine being able to get a delicious cup of coffee without the skills of a barista! Without knowing the optimal water temperature or contact time with the coffee. And on top, imagine you have a guarantee that you get this five-star quality cup of Joe every time, every day, every morning! You can stop dreaming because, with the BV1800 8 cup coffee maker from Bonavita, you found a winner! It is one of the rare drip coffee makers that has received the certification of the Specialty Coffee Association of America (SCAA). What the SCAA does is to ensure that coffee makers for the in-home use meet certain requirements. They have an easy to read booklet on their website. This booklet should answer all questions about the SCAA’s vigorous certification requirements. If not, feel free to ask me by leaving a comment below. 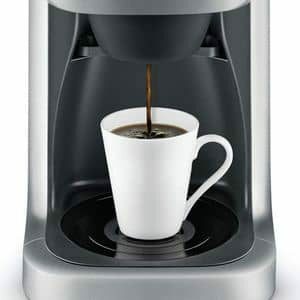 In general, the BV1800 8 cup coffee maker of Bonavita has everything you’ve always wanted in a drip coffee maker – it’s a marriage of perfection and convenience. The Bonavita BV1800 8 Cup Coffee Maker only comes with one button, the auto-off switch. The integrated heating plate will keep the brewed coffee in the glass carafe hot for two hours. Then the auto-off feature kicks in. But the real benefits are hidden inside the machine. It is crucial to continuously maintain the right water temperature between 195° and 205° Fahrenheit for the best coffee experience. 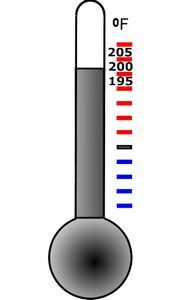 And, of course, you don’t want to wait a lifetime until the cold water has reached this temperature. 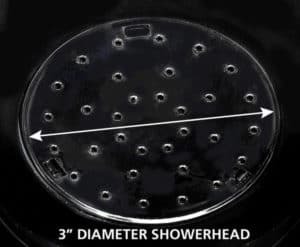 More precisely it takes about 20-30 seconds until you see it raining out of the shower head! Exactly for this reason Bonavita has equipped the BV1800 Coffee Maker with a powerful 1455 Watts water heater. The brewing process itself takes about 6 minutes. So go ahead and turn the coffee machine on. Meanwhile, you can brush your teeth and when you are back, your coffee is ready. The positioning of the shower nozzles is another key factor for the perfect coffee flavor. Bonavita did an excellent job with the cross-shaped positioning of the nozzles to get an evenly saturated bed of coffee grounds. As a consequence, the brewed coffee tastes almost as good as Barista’s most preferred method: the manual pour-over. 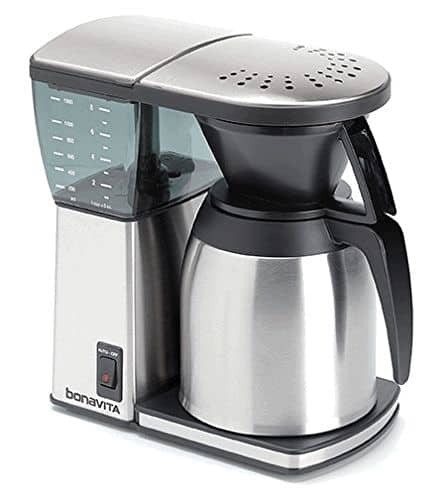 Bonavita is so convinced of the quality of the BV1800 8 Cup Coffee Maker that it offers a two-year warranty (link to the warranty information provided below). I believe, this is a big deal! One of my last coffee makers broke after 14 months! 2 months after the warranty had expired. Perfect timing, isn’t it! Did you ever experience the same frustrating moment? Then the one extra year of warranty surely comes in handy! Get 2 Years warranty with the Bonavita BV1800! Do all the features sound too good to be true? You’ll wonder how you ever managed without the Bonavita! Get it today! To put it briefly, the Bonavita BV1800 8 Cup Coffee Maker is a small machine. With only 12 inches in height, it surely fits under almost every kitchen cabinet. With about 12 inches width and 7 inches depth, it leaves enough room on the counter for your other small appliances. 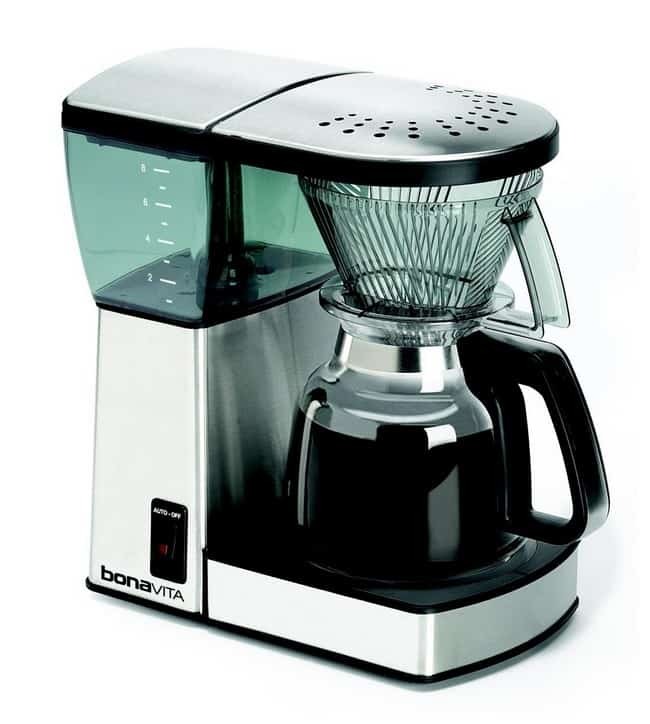 The frame material of the Bonavita Coffee Maker is BPA-free plastic wrapped in a thin layer of steel plates. The filter holder is made of high-quality semi-transparent plastic, which is also BPA-free. The inner strengths of the two machines are the same. But for a few bucks more you get the same coffee maker with a stainless steel carafe. So if you usually spread out your coffee consumption over several hours, please choose the stainless steel carafe. The heating plate of the cheaper glass carafe version keeps the coffee hot for 1-2 hours, that’s true. But every additional hour you can expect the coffee to taste more burned. Imagine you keep your coffee hot in a pot on the stove. I don’t think you want to do that for a long time, don’t you? Since the thermal carafe keeps the coffee hot automatically the heating plate is not necessary anymore. Immediately after the brewing process has finished, the Bonavita BV1800SS shuts off automatically. Your first impression was possibly deterrent, defensive and somewhat discouraging – a hefty price tag for no visible features or fancy display. But who should know better than the Specialty Coffee Association of America that the inner values of the Bonavita BV1800 8 Cup Coffee Maker entirely surpasses the visible features. Perfect water temperature, excellent extraction and outstanding timing produces one of the finest brewed coffee you can get from one of the best drip coffee ma﻿﻿kers. And don’t you deserve the best? Take the next step now and click the link below. Do you have the Bonavita BV1800 8 Cup Coffee Maker with glass or thermal carafe? Let me know below in the comments.